Barcelona is a large city and, like most large cities, at certain times of the day, it is swamped by the traffic. Because of this, if it's nice weather, a bicycle might be the best solution. The network of cycle lanes in Barcelona is already good and the intention is to increase the network even further. If you like pedalling, the fresh air and being able to get around at your own pace whilst enjoying the views, we will tell you about the Bicing service in Barcelona here. The Bicing Barcelona service started in 2007 and today it boasts being able to offer the services of some 6,000 bicycles which are spread right across the city. In Barcelona, the implementation of this cycle service has been a great success and because of this, the number of docking stations are continually increasing. If you're visiting the centre of Barcelona, you won't have any problem finding hundreds of bikes that are available across such iconic areas as Montjuic, Joan Miró, the Sagrada Familia or the Arc de Triomf, and you will also be able to try both a conventional bicycle and the electric version. What isn't ideal about the Bicing service in Barcelona is that for those who are visiting the city for a longer period, it is necessary to subscribe to the service on an annual basis. However, we'll start off by giving you some good news: the first 30 minutes of usage are free! After that, you will pay €0.74 for every 30 minutes. 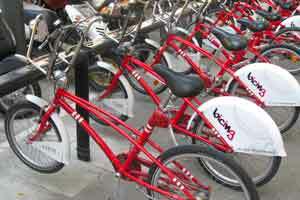 You can use the bicycles for fractions of the 30 minutes periods for a maximum of 2 hours. If you exceed this time continuously, there is a penalty so it is worth keeping track of your usage. If you are visiting Barcelona as a tourist, there are plenty of cycle companies available such as Green Bikes. You can enjoy a wide range of routes around the city of Barcelona. For example, you can come out of Plaza Cataluña heading towards the Barrio Gótico. This means passing in front of the Cathedral and you can then travel past Santa María del Mar en route to the Parc de la Ciutadella to see the areas commemorating Lluis Companys and Sant Joan, then pass by the Arc de Triomf and reach the Gran Vía so that you can head off to admire the beauties of the Sagrada Familia. From there you can carry on to the Paseo de Gràcia and admire la Pedrera and Casa Batlló following on along la Rambla as you enjoy the very essence of Barcelona. If you fancy a rest, you can stop off at any one of these places without any problems as you can buy the entry tickets here. And when I no longer want to carry on cycling? It is possible that after all that effort, you would quite like a break from your bicycle and might enjoy a coffee and a stroll to discover some of the other amazing sights in this city accompanied by someone who can tell you all about the secrets that this majestic city has. If that appeals, you can use our services with a private guide.